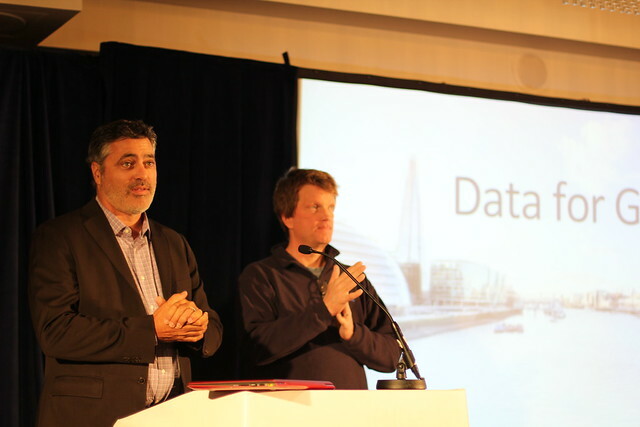 Cloudera Cares and DataKind UK recently co-hosted a Meetup following Strata + Hadoop World London and we were thrilled to meet the over 70 data for good enthusiasts that attended! Featuring speakers from Cloudera Cares, DataKind UK and Citizens Advice, the event was a great cross-section of the Data-for-Good movement itself. Using data science in the service of humanity requires more than just data, it requires people – the right mix of people from all sectors and backgrounds sharing their expertise and working together. Corporations like Cloudera play an important role in supporting data professionals using their skills to give back while charities like Citizens Advice bring not only data on critical social issues but also subject matter expertise to put that data into context and into action. DataKind convenes all of these talented people and supporters and ensures they have successful collaborations to demonstrate the power of data science and ultimately make an impact on the world. Cloudera Cares is Cloudera’s philanthropic arm, an initiative that is employee led and driven. Launched in early 2014, the program was able to donate around 1,400 employee hours and over $70,000 USD in less than 12 months. Clouderans strive to have a lasting impact on their surrounding communities, and this has been, and continues to be reflected through the 20+ non-profit organizations that Cloudera Cares partners with. Employees give back time by volunteering at food banks, museums, soup kitchens, etc. with various other activities such as donating coding hours, teaching elementary students math, and more. The Meetup offered a nice view of each of these players – what they’re focused on individually and how they all come together to make the world better using data. First up was Cloudera Cares. 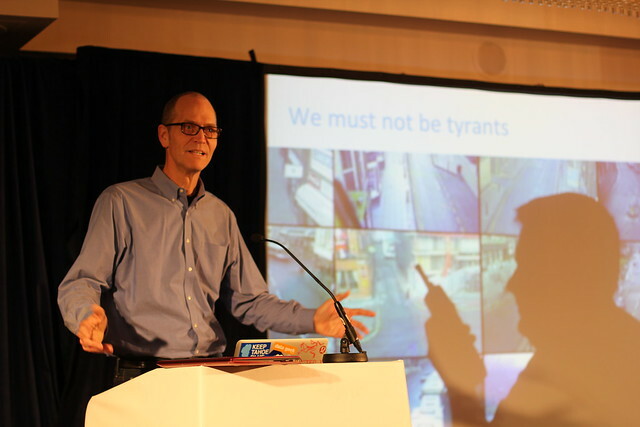 Doug Cutting, the Creator of Hadoop and Chief Architect at Cloudera talked about how data can be used for good over a plethora of industries, from education to healthcare. The industry has a whole has the ability to use their knowledge of Hadoop and big data to create a better world. 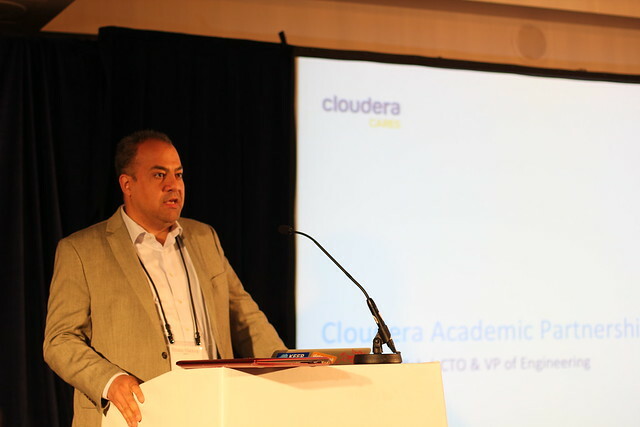 Amr Awadallah, Co-founder and CTO of Cloudera, then went on to talk about how Cloudera has been donating not only Cloudera Enterprise licenses to universities, but also providing schools with curriculum through the use of the Cloudera Academic Partnership (“CAP”), since 2012. The goal of CAP is to introduce college level students to the Hadoop ecosystem. This program allows for computer science departments, around the world, to access free curricula and tools, saving them money and time. The end result is a new generation of Hadoop, and aware IT professionals who will fill the skills gap for employers. 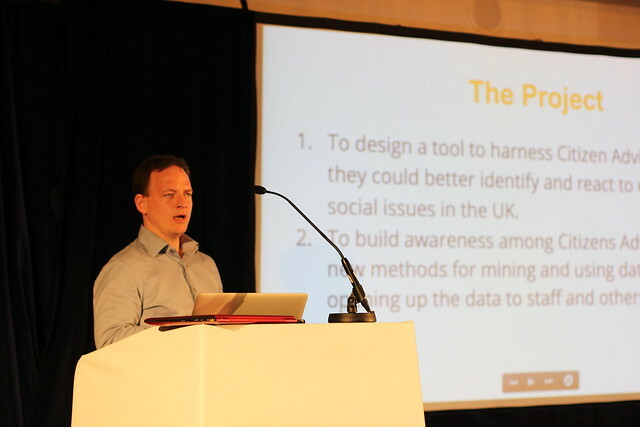 Next, Chapter Leader Duncan Ross spoke about DataKind UK’s work bringing together charities with data science experts on projects designed to move the needle on tough social issues. DataKind UK launched in April 2013 as DataKind’s first Chapter and is its own independently-run charity that upholds DataKind’s vision of using data in the service of humanity. Ian Ansell from Citizens Advice and the DataKind Data Ambassadors then spoke about the series of projects they completed with DataKind UK – two weekend DataDives and one longer DataCorps project. The result of which was a Civic Dashboard created by DataKind UK volunteers, Peter Passaro, Billy Wong and Henry Simms, to identify emerging social issues in the UK. As part of this engagement Citizens Advice also opened up its data, sharing it with other UK charities – the North East Child Poverty Commission and St. Mungo’s Broadway. Read more about this collaboration in the Data For Good Report from Nesta, the project funder,or in this blog detailing their key learnings. Last, but certainly not least, Mike Olson, Cloudera Co-founder and CSO and DataKind Board Member and Tom Reilly, CEO of Cloudera, came to the podium to talk about the powerful role data can play in addressing tough social issues. While each speaker was equally impressive on their own, the real magic is when these three groups – corporations, mission-driven organizations and committed data professionals come together to harness the power of data science in the service of humanity. Check out the photos, courtesy of Alex Moundalexis, and see the full slide deck below for more! If you’d like to get involved to help, stay up to date with Cloudera Cares and sign up to get involved with DataKind. If you’re in London, definitely check out DataKind UK’s next DataDive July 17-19! This blog was co-written by Alison Yu (Social Media Manager, Cloudera) and Miriam Young (Communications Specialist, DataKind).